Near the end of each hockey season, there is an infusion of young talent at the American Hockey League level as players in junior leagues and the NCAA finish their seasons and have the opportunity to join AHL clubs for a brief look at life as a professional. For the college guys, it means they signed a pro contract and are done with school. For the junior players, it is possible their brush with pro hockey is not permanent, as those who are eligible end up back with their junior teams the next season -- unless they make it in the NHL. This specific collection of players often makes up a portion of the AHL's rookie class, and because of the NHL lockout, that group will be a little bigger this season when the league opens play Friday. Those players have an advantage over other rookies because they've spent time with AHL teams in the past and know what to expect, and in a few cases they actually have NHL experience, as well. Here's a look at the top members of the AHL's new crop of rookies who made cameo appearances in the league (or in the NHL) in previous seasons. 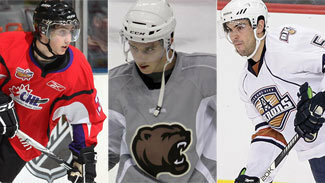 For a look at the players who will be experiencing North American professional hockey for the first time, click here. Brock Nelson, Bridgeport: Nelson was third nationally and led the Western Collegiate Hockey Association with 28 goals for the University of North Dakota last season. A first-round pick in 2010, Nelson signed with the New York Islanders after his sophomore season and appeared in six games for Bridgeport, two of which came in the first round of the Calder Cup playoffs. Jeremy Welsh, Charlotte: Welsh had 27 goals in 40 games for Union College to help the Dutchmen to the Frozen Four, and the Carolina Hurricanes landed one of the most coveted NCAA free agents shortly after his trip to Tampa, Fla. Welsh made it a whirlwind few days by debuting with the Hurricanes in their final game of the season. Chris Kreider/Dylan McIlrath/J.T. Miller/Christian Thomas, Connecticut: Kreider became a household name for NHL fans, first as part of trade rumors between the New York Rangers and the Columbus Blue Jackets at the trade deadline then after scoring five goals in 18 Stanley Cup Playoff games for New York. He'll get his first taste of the AHL along with three other top-flight Rangers prospects who saw action for the Whale at the end of last season. Kreider (2009), McIlrath (2010) and Miller (2011) all were first-round picks. Thomas, the son of ex-NHL player Steve Thomas, was a second-rounder in 2010. McIlrath won't be ready for the start of the season after injuring his knee in late June. Andrew Gross of the Bergen Record reported McIlrath, who has yet to being skating, will have the knee examined next week. Jason Zucker/Brett Bulmer, Houston: Yep, more Minnesota Wild prospects. They have five highly touted players who will be getting their first taste of AHL hockey this weekend, and these two are joining them to form an incredible rookie class for the Aeros. Zucker went from the University of Denver to the Wild for six games, while Bulmer started the season in Minnesota and ended it in Houston after his season ended with Kelowna in the Western Hockey League. They're two-thirds of the picks Minnesota made in the second round in 2010 (Johan Larsson was the third), and both are in the top 10 on one of the toughest prospect lists to crack. Tyler Toffoli, Manchester: The Los Angeles Kings brought back their entire roster from a Stanley Cup triumph, and have a few young players who saw some action earlier in the season who want to squeeze back onto the roster. Then there is Toffoli, a second-round pick in 2010 who led the Ontario Hockey League with 52 goals for Ottawa in the regular season, then added 11 more in 18 playoff games. Toffoli didn't make it to Manchester last season, but in 2010-11 he scored in the only regular-season game he played, and added another goal in five playoff games. Austin Watson/Mattias Ekholm, Milwaukee: Watson was the Nashville Predators' first-round choice in 2010, and had 35 goals and 85 points in 80 OHL games last season, including 10 goals and 17 points in 19 playoff games for the champion London Knights. Before that, Watson finished the 2010-11 season with eight games for the Admirals, including five in the playoffs. Ekholm played two games for the Predators last season before returning to Sweden. He'll get a more full taste of life in North America this season. Emerson Etem, Norfolk: Fans in the Tidewater area aren't going to see the same Admirals in their attempt to repeat as AHL champs -- the Tampa Bay Lightning and Anaheim Ducks switched affiliates in the offseason. Norfolk fans are going to see one of the most prolific scorers in the world from last season. Etem led all three Canadian junior leagues with 61 goals for Medicine Hat. He added seven goals and 13 points in seven WHL playoff games, and acquitted himself well in the AHL, scoring two goals in four playoff games for Syracuse. Only Ty Rattie of the Portland Winterhawks of the WHL scored more (76 goals, including the postseason), and Rattie played in 12 more games. Etem, the Ducks' first-round pick in 2010, is a Southern California native. Jaden Schwartz, Peoria: Like Kreider, Welsh and Zucker, Schwartz had a cameo in the NHL instead of the AHL at the end of last season. After two seasons at Colorado College, he signed with the St. Louis Blues and the 2010 first-round pick had two goals and an assist in seven games for them at the end of the regular season. Brandon Gormley, Portland: Gormley was a first-round pick in 2010 and made his AHL debut for the Phoenix Coyotes' former AHL affiliate in San Antonio two seasons ago. Last season the defenseman was busy, helping the Shawinigan Cataractes win the Memorial Cup. He was injured for much of the season, playing 35 regular-season games before returning during the team's postseason run. He scored 15 goals in 42 QMJHL regular-season and playoff games when healthy. Drew Shore/Quinton Howden/Alexander Petrovic, San Antonio: The biggest names that are part of the Florida Panthers' elite collection of prospects are Jonathan Huberdeau, Erik Gudbranson and Jacob Markstrom, but these three players are part of why the Panthers are the envy of many other NHL clubs when it comes to young talent. Shore, Howden and Petrovic all joined the Rampage near the end of last season and saw action in the AHL playoffs. Howden was a first-round pick in 2010, while Shore (2009) and Petrovic (2010) were second-round choices. Alex Chiasson/Austin Smith/Reilly Smith, Texas: A trio of college stars joined the professional ranks at the end of the 2011-12 season. Austin Smith, a Texas native playing for Colgate, led the NCAA with 36 goals, then played 12 games for Texas, totaling three assists. Reilly Smith was second to Austin Smith with 30 goals in 39 games for Miami (Ohio), and finished his season with three games for the Dallas Stars. Chiasson had 46 points in 38 games for Boston University, then added a goal and five points in nine contests for Texas.